What’s up at CBP | The COMMUNITY BOAT PROJECT | Where young people effectively Work, Learn and Play! 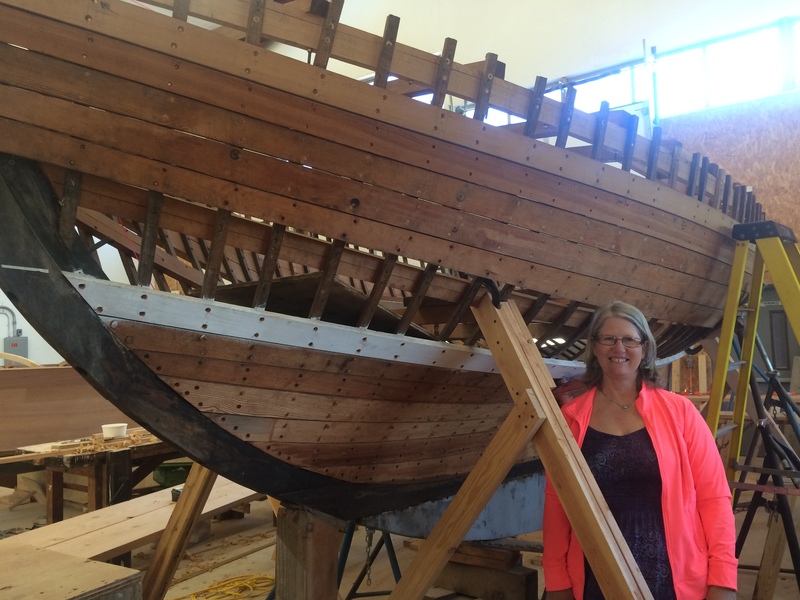 The Northwest School of Wooden Boatbuilding has completed an extensive restoration of Felicity Ann, the 23-foot sloop that in 1953 carried Englishwoman Ann Davison into maritime history as the first woman to sail solo across the Atlantic. 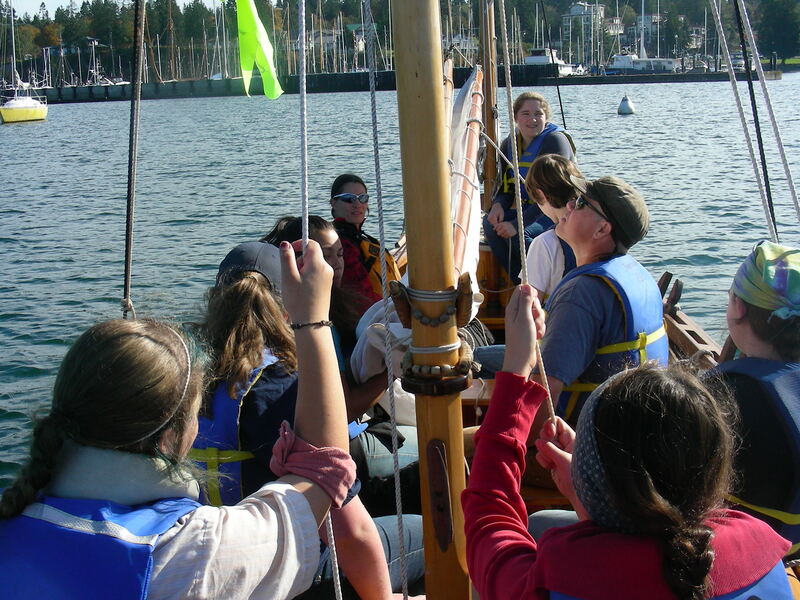 ​This small but mighty wooden boat makes her public debut at the 2017 Port Townsend Wooden Boat Festival under the stewardship of the Community Boat Project, now in its 10th year of providing hands-on, intergenerational maritime education in Jefferson County. Felicity Ann gleams in her new home in the Community Boat Project shop, where she will be outfitted this winter for sailing next summer. You can find Felicity Ann on her trailer at the Community Boat Project’s usual spot, located between the music stage and the inner harbor. Come aboard! A 20-minute talk is presented at the boat twice daily on Friday and Saturday, and once on Sunday. Ann Davison was an unlikely singlehander who probably never would have gone to sea if she hadn’t fallen in love with a sailor. 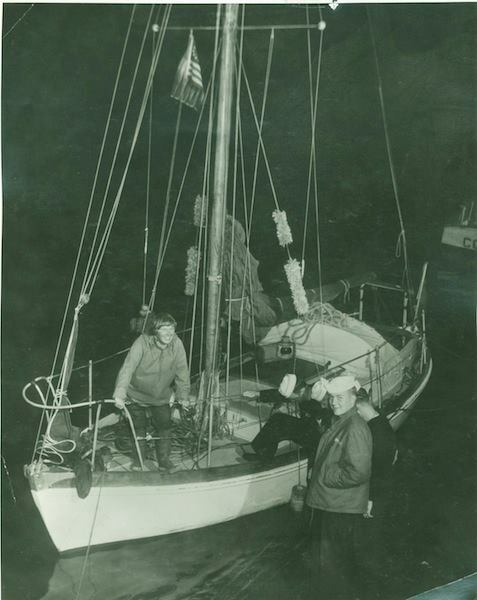 She first had to learn to sail and use a sextant, and then nearly ran out of food, water and cigarettes during her slow (and radio-less!) 65-day crossing. But she succeeded, and dedicated her effort (and the resulting memoir, My Ship Is So Small) to her husband, who had died three years earlier in a shipwreck that she miraculously survived. Ann Davison’s courage and grace in the face of adversity inspires us today. The hardy Voyagers have returned safely after having endured blustery winds, flat calms, long miles, and far more rain than than anyone would want with minimal shelter available. 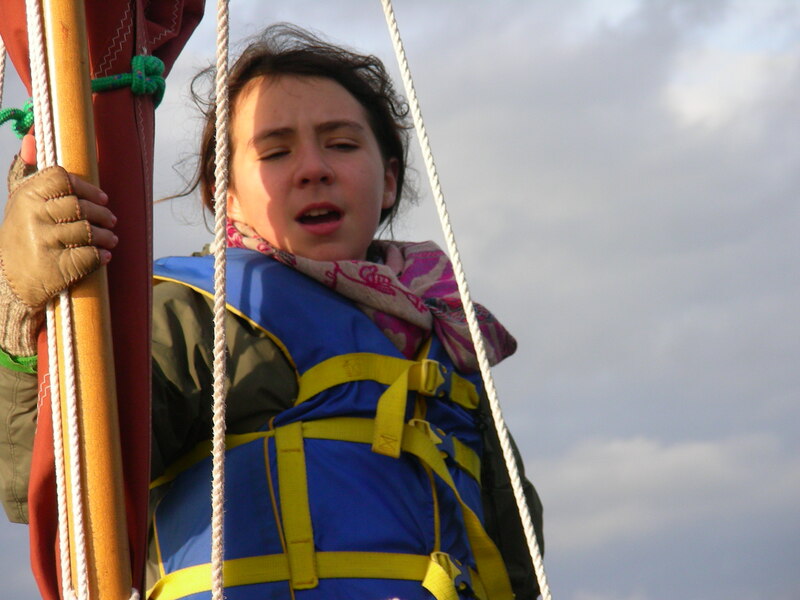 We rowed and sailed over 30 miles, with either no wind at all or it blowing directly from where we wished to go. Yet despite the blisters, the drenching rain, the contrary wind and the creeping chill, spirits were kept up by camaraderie, jokes and above all – song. We sang a bit of everything from sea chanties to show tunes. This Voyage proved true our motto “Grace in the Face of Adversity” and like a fine knife of good steel tempered in fire, water and oil, our crew came out better, stronger and wiser. Fair weather may be comfortable and easy, but you don’t learn nearly as much, about the craft or about your self. Another thing we learned was the importance of flexibility, as many times the weather thwarted our plans and we were forced to improvise. On the whole it was a challenging, but great Journey with one of the best crews ever . Our tiny house grows, the Wink’n is ready to row, Epic’s new mast takes shape with a sweet marriage of traditional and modern rigging . The baby boat 2 has a skeg, musical instruments continue to form, and more marvelous carvings emerge from the wood work. We prepare for our annual Journey; packing, planning and practicing. This year we start in Quilcene and head North stopping in Fisherman’s Harbor, Port Gamble and Mats Mats. 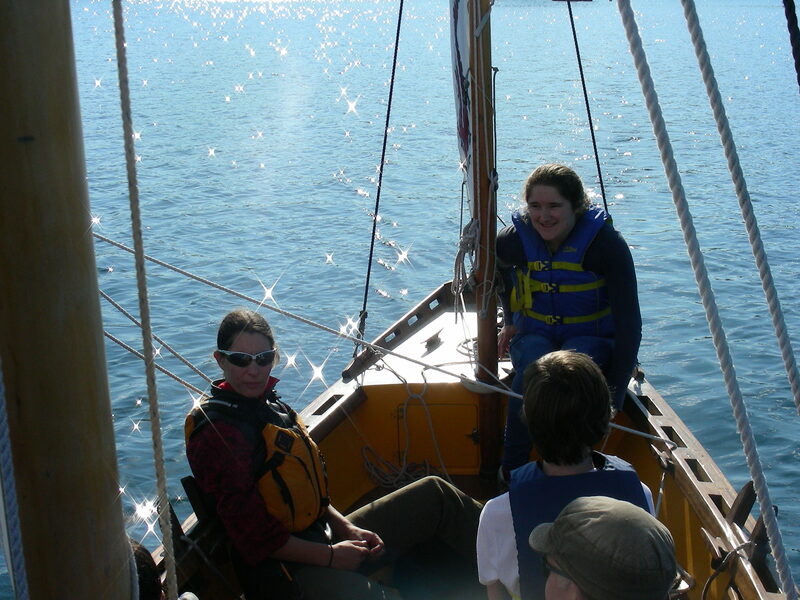 But life is not all just work, we have still been getting out on the water each week to relax with some sailing. Between the autumn mists and sunny days time rolls by. At the Community Boat Project so many things are being created, restored, built, sold. Onward! our second-built longdory was recently sold. 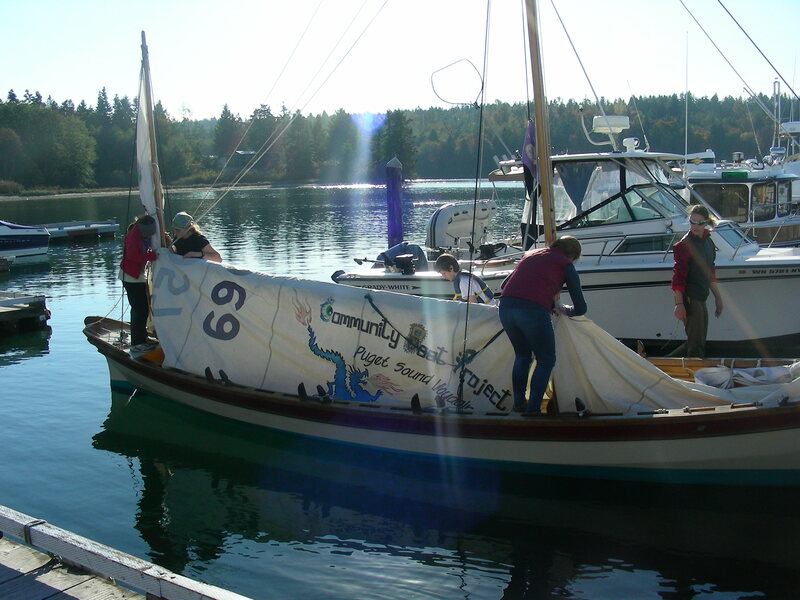 Her new owners plan to take her on the Race to Alaska with the all female team Kraken Up. Farewell Onward! You have served us well, we will miss you. May you have fair winds and calm seas on your future voyages. 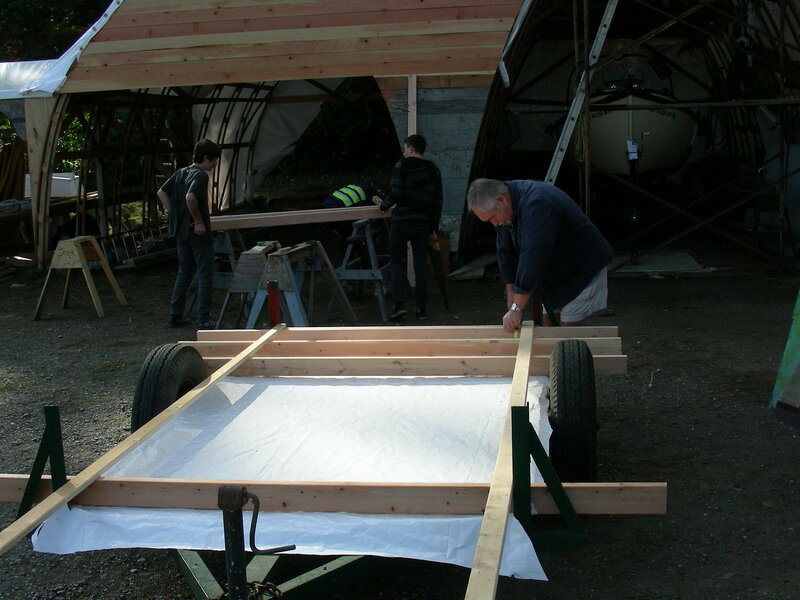 Our Boatbuilding class is undertaking an entirely new type of project this year; a land ship! Inspired by the tiny house movement we are teaching our students practical homebuilding skills by building a Vardo-style wagon. 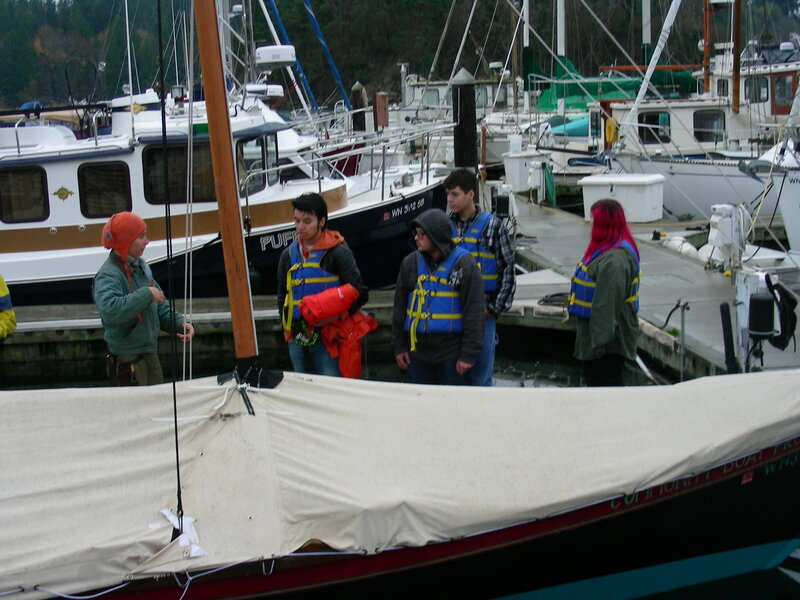 A Vanguard of 4 new students from Quilcene Schools came up to experience CBP and the longdories. They took to it like ducks to water. We hope to have them and more join us again soon. 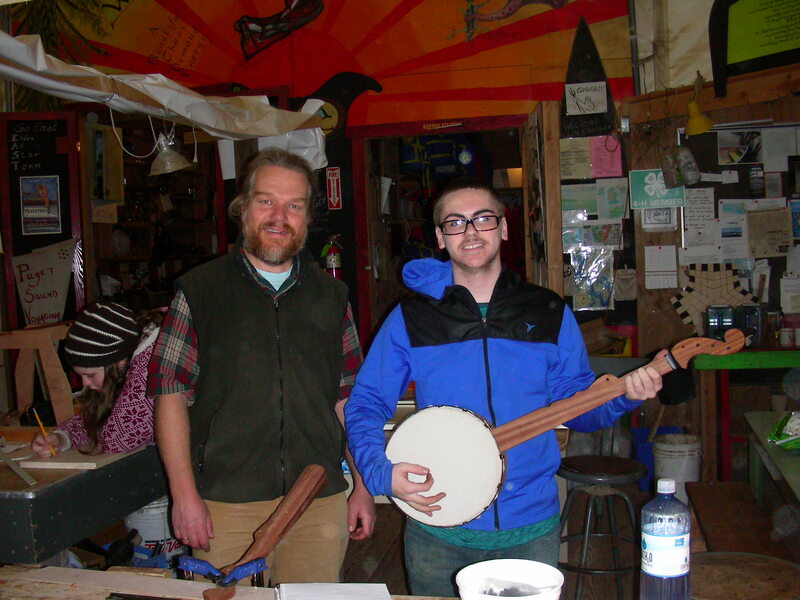 Luthier Scott Marckx, a local violin maker, is working with our students to build sailor’s banjos. These instruments feature steam bent bodies, sail cloth heads, and artistic hardwood necks. The weather continues to defy forecasts in our favor and we have gone out every week. Most recently we practiced docking with each student taking their turn to direct the crew and vessel in departing and returning to our particularly tricky slip. A light southerly wind made things more complex, but the crew were all up to the challenge and learned the valuable lesson ‘If you go slow enough nothing can go wrong that you can’t handle.’. Jim and I were going on a road trip. We tossed around a lot of different choices, The Sunshine Coast, the San Juan Islands, Hornby, Quadra. Then, the night before we decided to go to Washington State. We booked a ferry from Victoria, and spent two nights in Sequim. On the second day we made a 2-hour trip to the northwestern tip of Washington State to see Cape Flattery. We had been told it was a beautiful park and set out to find it and explore. We took our time heading out and at one point we pulled over to let a line of cars pass. We ended up pulling over right where there was a garage sale sign. I was immediately game for it, but Jim not so much. We went anyways and found a beautiful little home and acreage. Not much to buy, but the owners were very interesting. They had met in Victoria, BC; she was from Port Alberni and he was in the Navy. We had a nice chat with them and they mentioned we should stop at Freshwater Bay before we went back to the highway. It was a beautiful bay and we ended up having lunch there. We talked to a young fellow on the beach who had just come in from kayaking. In our idle chit chat we learned that he was going to school at the Northwest School of Wooden Boatbuilding. I asked if him people still built wooden boats, in which he replied that it wasn’t so much building new boats but refitting old boats. Days later we were in Port Townsend, a lovely little town that we planned to stay only one night and ended up spending four. On our third morning , I was responding to a family email going around and mentioned we were in Port Townsend. My sister, Felicity Ann nicknamed “Filly”, questioned why I was in Port Townsend. 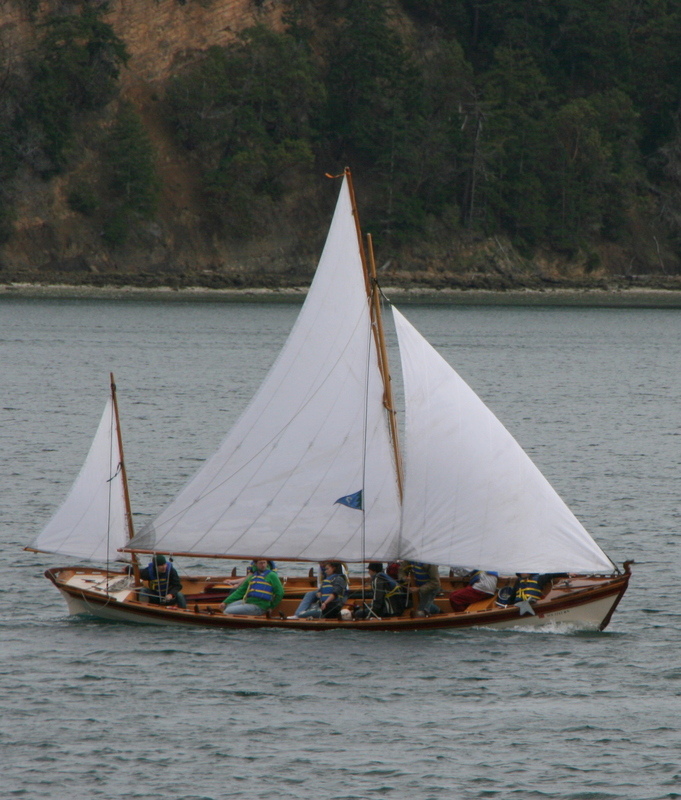 She responded with another email saying that the boat she was named after, the FELICITY ANN was in Port Townsend. My first thought was that why would she know that the boat she was named after was in Port Townsend? What sort of person keeps tabs on the boat she was named after? Jim and I decided to see if we could find this boat. 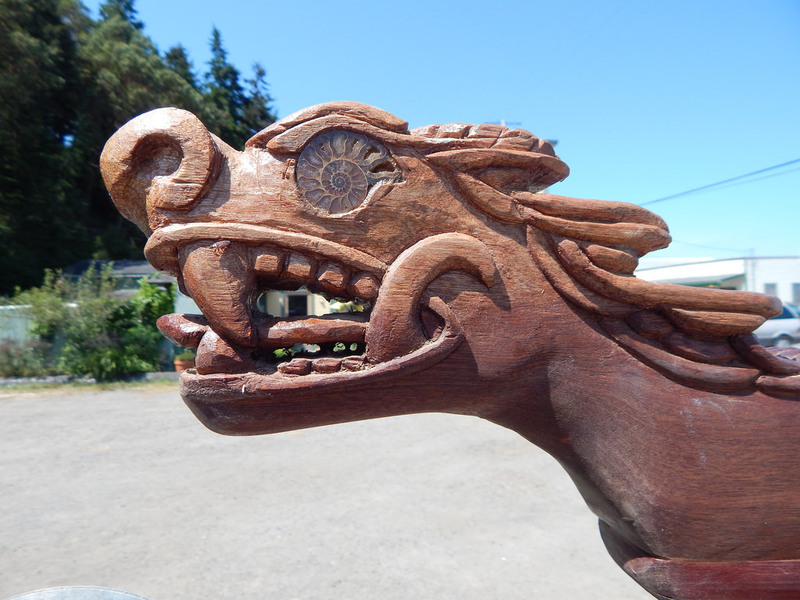 We went to the big marina in Port Townsend (the Boat Haven) and asked around. 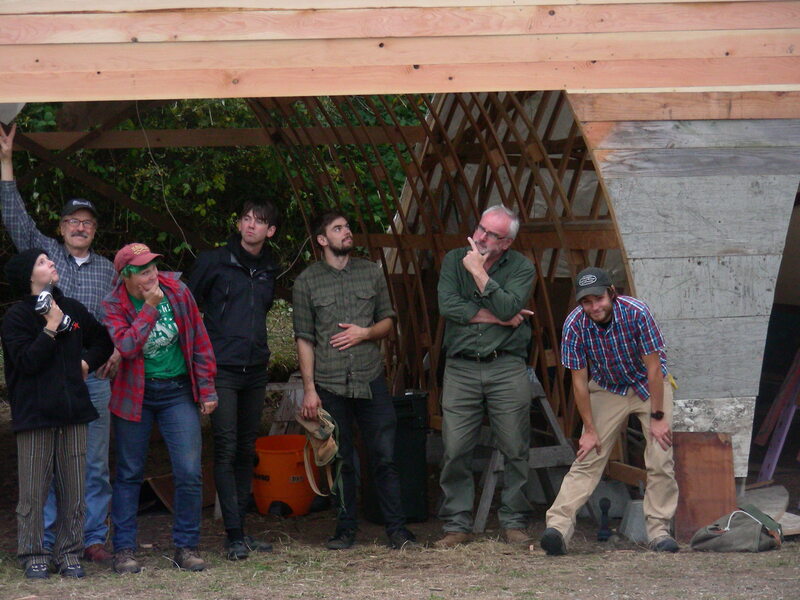 Half a dozen guys had no idea what we talking about until one fellow said that the boat was at the Northwest School of Wooden Boatbuilding in Port Hadlock. What the heck, here goes another road trip. We ended up finding the place at lunchtime. There weren’t too many people around at that time, so it took a while to find someone to ask where the FELICITY ANN was. Jim ended up connecting with Betsy Davis, the executive director of the Boat School. She was a really nice women and super excited to hear about somebody being named after the boat. She gave us tons of info and wanted us to meet some of the women working on the boat. Tina H. in front of FELICITY ANN, the boat her sister was named after. Like I said it was lunchtime, so I had my picture taken with the boat and we waited for the students to come back to class. Well, lo and behold who walks up to the boat shop but a familiar looking figure. It turns out to be Matt, the fellow we met at Freshwater Bay who is working on restoring the Felicity Ann. I had to tell him the whole story so he wouldn’t think we were stalking him. Talk about serendipity. All around, everyone was very nice and Betsy was super excited to meet Felicity Ann and wondered if she would like to go out sailing on the boat once she was finished. So, my sister Felicity Ann, for your birthday gift, I ordered the book, “My Ship is So Small”, Ann Davison’s story of crossing the Atlantic Ocean in her mighty ship FELICITY ANN. Thanks for the adventure. We loved it and all the people and stories that went along with it. After this connection, Tina’s sister Felicity Ann rallied her friends and family in making an amazing contribution to the restoration of the historic boat. We couldn’t have asked for a better story or stranger act of coincidence. We are very excited to be connected to a family who is willing to go the extra mile in winding the past, present, and future together. Once again as fall settles in to the region the Community Boat Project starts buzzing like a bee hive. 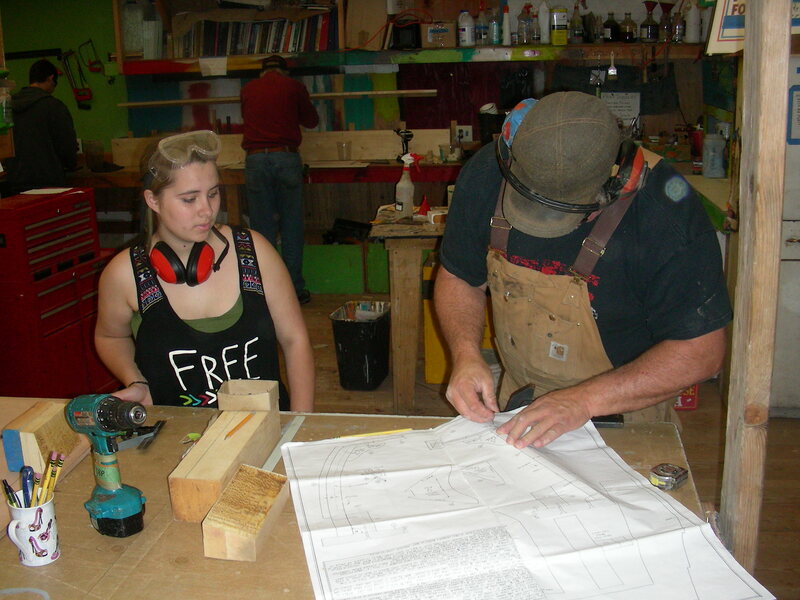 Both our Boatbuilding and Voyaging classes are underway again. In the shop a multitude of projects are being taken up including finishing touches on Epic, a new cradle-boat, and the continuing restoration Winken and Blinken. Outside a new storage/covered space is going up with the help of many volunteers. On the water our Voyagers have shown their mettle with silent consensus driven rowing challenges, and thorough sail setting drills. The weather has been exceptionally kind and beautiful the past few Fridays. Campaign 70% of the Way There!